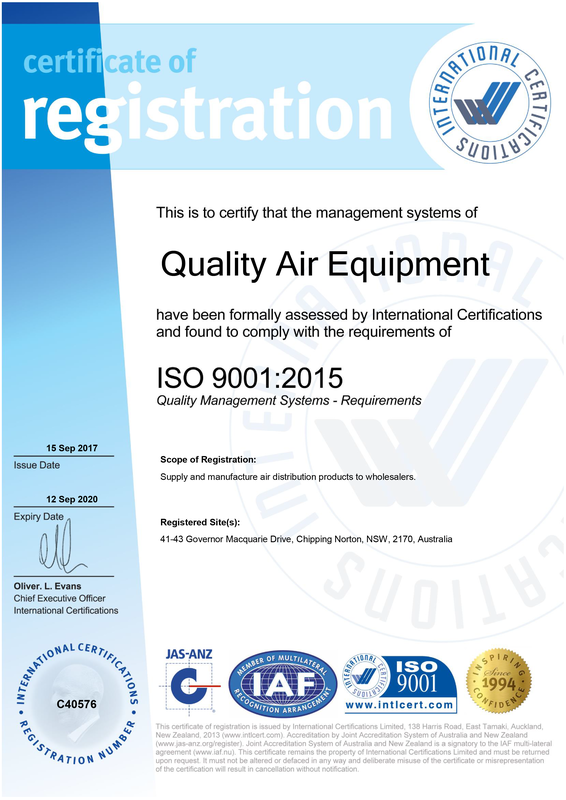 Quality Air Equipment (QAE) is extremely proud to have been awarded ISO 9001 certification. As an internationally recognised standard, our customers are ensured of consistent high quality products, delivered every day to our customers through effective quality management. Establishing an ISO 9001 system is the best way QAE can demonstrate the organisation’s ability to consistently provide products and services that meet their existing and future customer’s requirements. QAE went through an evaluation process that includes quality management system development, a management system documentation review, pre-audit, initial assessment and clearance of non-conformances. The benefits in having ISO 9001 are simple. We believe it places Quality Air Equipment ahead of the field – distinguishing QAE from our competitors. It is also a significant milestone in our continual efforts to improve and reflect on our ongoing investment in technology, development, processes and procedures. Quality Air Equipment strives to deliver the right product and services on time, every time and most importantly at the highest quality. It is an achievement that shows that we are committed to providing consistent quality products and unrivalled services to all current and future customers.